Need to find an arborist in the state of Kentucky? Ordinance to be emailed directly to you. Only KAA Members in good standing are eligible to utilize the library. A Credit Card # must be submitted to check out any item. Books and other items may be checked out for a three-week period. Check out renewals are limited to two additional three-week periods, for a total of nine weeks. The KAA Librarian must be contacted prior to renewal expiration to prevent fines. Fines accumulate at $0.50 per day per item, not to exceed 2X the cost of the item, or $50, whichever is less. Outstanding fines may be added to Membership dues. No more than three items may be checked out at any given time. All postage fees associated with sending or returning items are the responsibility of the lendee. 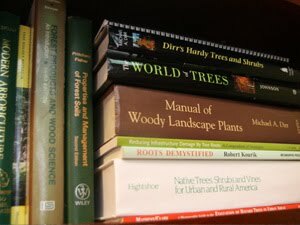 Please contact the KAA Librarian at Limbwalker Tree Service at (502) 634-0400 to check out materials.